Shadow energy minister Lily D’Ambrosio (Labor) addresses the packed Portland Forum. 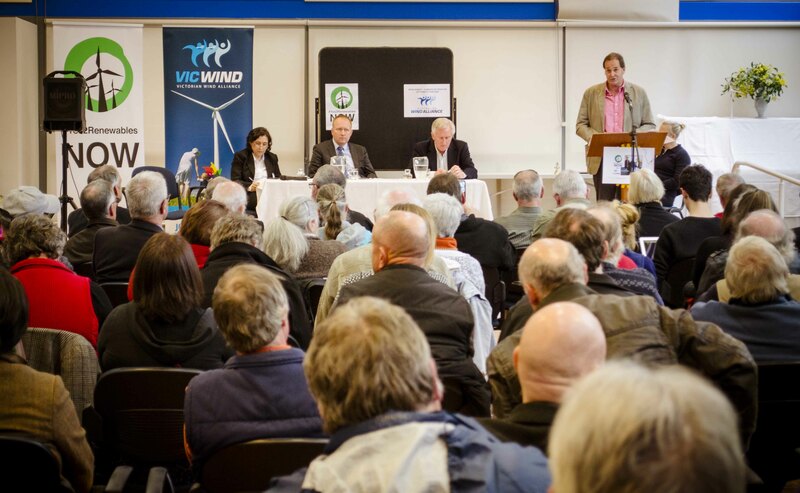 Victoria has got what it takes to grow and maintain a thriving renewable energy jobs sector, but government policy roadblocks are standing in its way, a packed forum of locals heard in Portland on Sunday. Former Australian Liberal party leader, Dr John Hewson, kicked off the Renewable Energy & Jobs Forum. Dr Hewson said governments need to do much more than we’re doing today to address climate change. “There are enormous opportunities from a sensible response to climate change,” Dr Hewson stated, referring to the jobs that can be created by the growing renewable energy sector. Former Australian Liberal leader, Dr John Hewson thinks a Victorian Renewable Energy Target is a good idea. Speakers from Portland-based businesses that employ hundreds of locals told the packed audience that renewable energy is a key pillar of south west Victoria’s regional economy. Keppel Prince Engineering special projects manager Mike Noske said the cost of solar had now reached a good price point. Portland’s solar energy guru, Mike Noske. Ahead of the November 29 state election, politicians spoke about their plans for growing renewable energy jobs across Victoria. Simon Ramsay MLC (Liberal party), Lily D’Ambrosio (Labor), and Greg Barber (The Greens) attended the event. Local member and Victorian Premier Denis Napthine was invited but did not attend. Simon Ramsay MLC stands in for Premier Napthine and the Energy Minister Russell Northe. 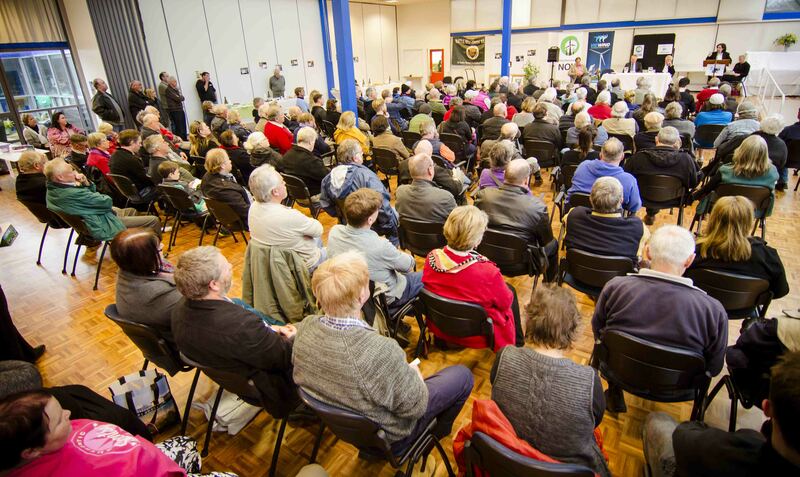 It was a pity local member, Premier Napthine’s was unable to attend the event. Renewable energy jobs are important to Victoria. The Premier missed the opportunity to let his constituents know he’s on their side. With PM Abbott threatening to axe the Renewable Energy Target, Victoria needs an insurance policy. Friends of the Earth have been calling on all political parties to reactivating the Victorian Renewable Energy Target. This step will create jobs and unleash investment, which is something all political parties can support. 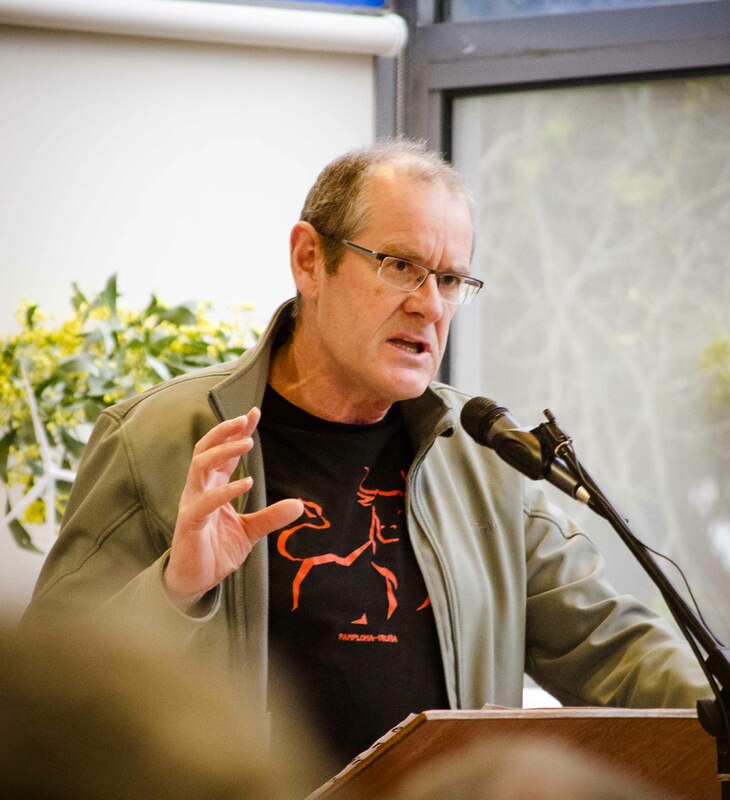 Greens leader Greg Barber used the forum to announce his party’s support for a Victorian Renewable Energy Target—a scheme that was introduced by the Labor government in 2007. 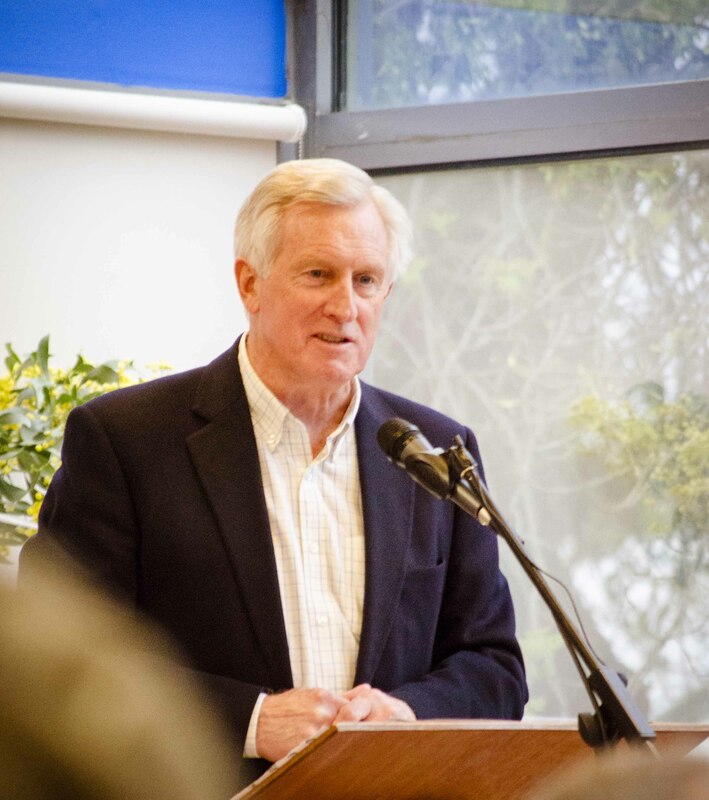 Former Australian Liberal party leader Dr John Hewson endorsed a renewables target for Victoria. 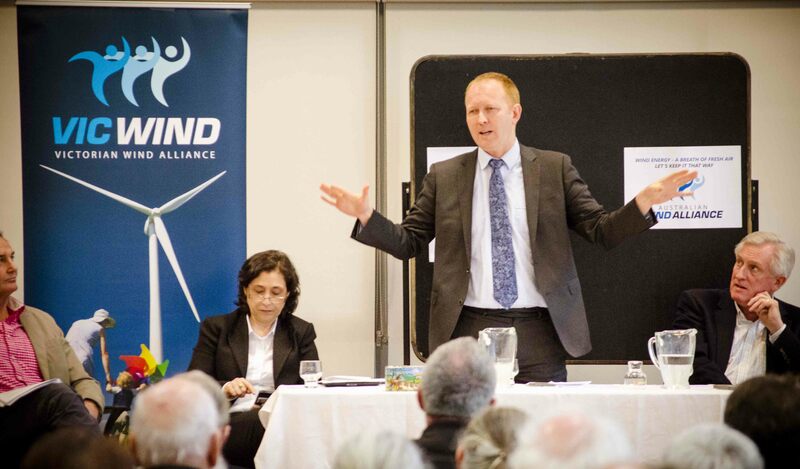 Victorian Greens leader backs the call to reinstate the Victorian Renewable Energy Target. National and state Renewable Energy Targets can work side-by-side and would create investment certainty for ‘shovel-ready’ wind farms to begin construction. “Wind energy is crucial to south west Victoria’s economy and both Federal and State laws need to work hand-in-hand to see it prosper,” said Andrew Bray, National Coordinator for the Australian Wind Alliance. The Australian Wind Alliance and Friends of the Earth say former Premier Ted Baillieu’s retirement gives the Napthine government an opportunity to review the anti-wind planning laws that cost jobs. “The retirement of former Premier Ted Baillieu allows the Napthine government to hit the ‘reset button’ on wind farm planning laws that have largely shut down new wind farm development in the state,” said Andrew Bray. 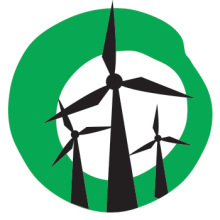 Click here for a running commentary on the Renewable Energy & Jobs Forum. Sign our petition calling on Premier Napthine and opposition leader Daniel Andrews to support a Victorian Renewable Energy Target. . Please support our campaign by getting involved or making a donation. Reblogged this on Energised Communities.